A tale of forbidden love in a wartime setting, Suite Française is an English-language adaption of Irène Némirovsky’s posthumously published 2004 novel of the same name written during the Nazi occupation of France during World War II. Entrusted to one of Némirovsky’s daughters after her death in 1942 aged 39, the manuscript was left unread for 30 years. What was finally uncovered was the fictional story of love during war from an authentic female viewpoint. This romantic World War II drama centers on the forbidden romance between a French villager and a German soldier during the war’s early years. Starring Michelle Williams, Matthias Schoenaerts, Kristin Scott Thomas, Ruth Wilson and Sam Riley to name a few, the film boasts an all-star cast. Suite Française plays out the moment when war came to the countryside as fear grips the small town of Bussey, France. 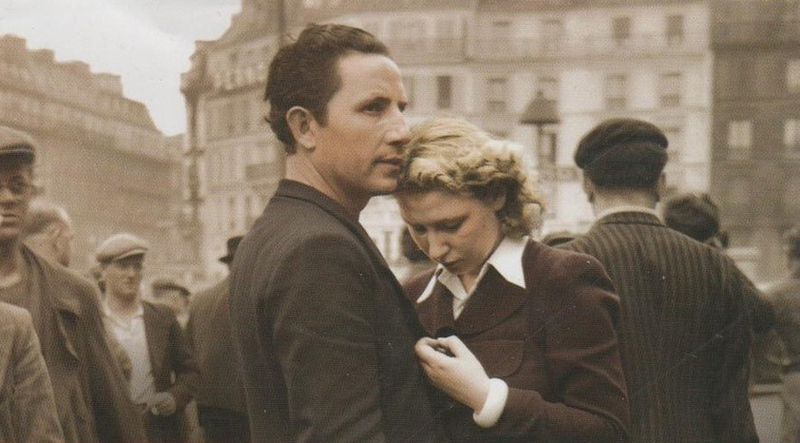 Under Nazi occupation, the well-off families were forced to take in members of the German military, which saw Bruno von Falk (Schoenaerts) lodged in the Angellier household. Despite a frosty start in which both Lucile (Williams) and Madame Angellier (Scott Thomas) refuse to speak to or make eye contact with Schoenaerts’ character, a relationship quickly develops between Lucile and Bruno, as she believes that his actions are merely a circumstance of war. Williams is well cast as Lucile, the picture of innocence as Lucile Angellier, a woman trapped in a stifled existence with her controlling mother-in-law as they both await news of her husband who is a prisoner of war. Similarly, Schoenaerts confidently inhabits his character as the handsome and refined German officer who is drawn to Lucile by a powerful love. Perhaps Scott Thomas somewhat steals the show as the up-tight Madame Angellier who could ‘scare the plague away’ as Bruno remarks in the film. All the characters work tirelessly and pull the film together competently, even the small cameo role by newcomer Margot Robbie as Celine who is unrecognizable, boasting minimal makeup and a short brown cropped hairstyle. The film plays out the tragedy of war as Lucile and Bruno are brought together only to be separated due to being fundamentally on opposing sides; Lucile the victim of the invasive occupation and Bruno a high ranking Lieutenant tasked to, amongst many things, find and kill Benoit after he kills a German officer. The many stolen moments between the couple remain nonetheless touching, as their forbidden glances do not go unnoticed for long. However Lucile quickly rejects Bruno’s love, unable to reconcile their viewpoints. It must be noted that Bruno is never truly unlikeable and his affection for Lucile cannot be denied. However they remain fundamentally too different. Perhaps the strangest element of the film is why all the characters speak with English accents despite the film being rooted in France. From this view, it is a shame that the film didn’t ring more true with a French cast. Suite Française is, if anything, very fast paced, fitting a lot into is 107 minutes. Pulling together multiple threats of the large cast whilst remaining true to the original novel is a hard thing to do. However, Dibb has achieved much in Suite Française, remaining solidly based within a period setting and hitting poignant tones surrounding the film’s melodrama and the realities of the Nazi occupation.